The last step in the process of Label & FlexPack production is slitting and rewinding with integrated quality assurance. Karlville successfully supplied to this market their slitting & inspection machine solution for narrow web label converters with the model KSI ProLabel and KSI ProCombi up to 650 mm width. Our company expanded in this market with a new model, the KSI-1000, to cover the mid-web market with its proven technology. Karlville’s new KSI-1000 is a compact overhead solution with a smaller carbon foot print than individual in-line units. Easy of operation and access to splice tables and slitting section are key ingredients of this concept. 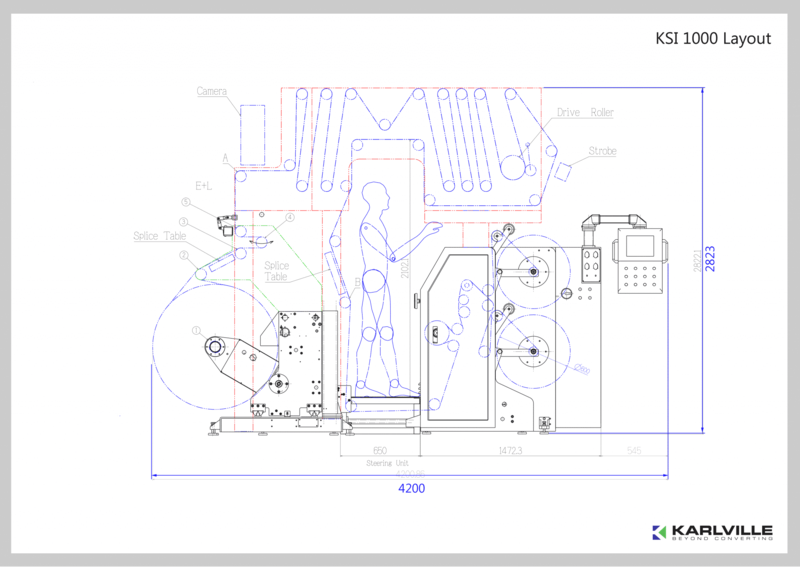 The KSi-1000 with a max web width of 1000 mm, has an operating speed of up to 400 m/min, using the newest drive technologies for advanced fully automatic closed loop tension control, and dual bi-directional differential rewinds. The KSI 1000 inspection/slitting/rewinding machine incorporates a shaftless unwind for 1000 mm diameter rolls with an easy accessible splice table. A short web path thereafter a 100% inspection system with horizontal orientation allows immediate detection of defects. The web then travels overhead in a multi-loop section to accumulate enough web length to stop the machine before a detected defect has reached a second easy accessible splice table. After the defect has been removed, the web travels vertical down through a steering system for final web alignment into Karlville’s well-known slitting and rewind model HSI for excellent slitting and rewind roll quality. The slitting section with tangential web path allows bottom knife positioning without spacers. Individual top knife holders, mechanically or pneumatically operated, are effortlessly placed and locked. The KSI 1000 is outfitted with programmable logic controller and a touch screen interface that corresponds with a smart controller. This controller includes proprietary software written for accurate label counting, multi-lane missing label detection, tag detection, and matrix waste calculations.